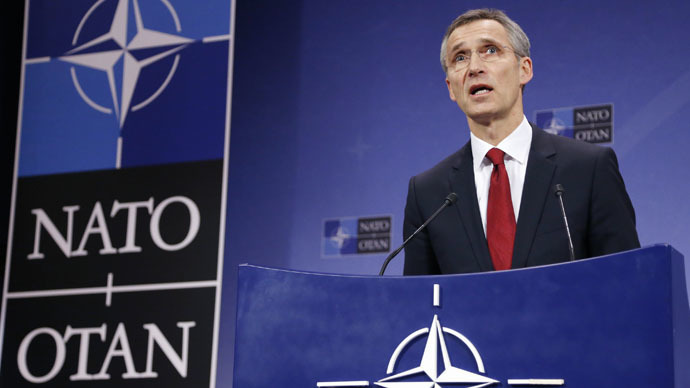 The NATO Secretary General has said the Alliance will increase its presence in the Ukrainian capital, sending its representatives to consult the country's defense ministry. Jens Stoltenberg was speaking to the media after a meeting of NATO member states' foreign ministers took place in Turkey's Antalya on Wednesday. "We have strengthened our office in Kiev, provided advisers to the government of Ukraine, including the Ministry of Defense," he said. "Our close cooperation will strengthen Ukraine's ability to defend itself. We have stepped up our support to Ukraine on command and control, logistics, cyber defense and rehabilitation of wounded soldiers," the NATO chief added. He also said that the alliance sees reforms by Kiev as the main way to stabilize the situation in Ukraine: "We welcome Ukraine's efforts to promote reform and reconciliation... NATO stands firm in our support for Ukraine's sovereignty and territorial integrity." He once again accused Russia of getting involved in the conflict: "We see...continued Russian support for the separatists to destabilize Ukraine. We call on all sides to comply with the Minsk agreements," he said, adding that "Russia has a special responsibility in this respect." However, Stoltenberg said the it would be unfair to say that Russia-NATO relations are in a state of cold war. "We are not in the same situation as we were during the Cold War period after the Second World War until the fall of the Berlin Wall in 1991," the Secretary General told the media, albeit adding that "We are neither in the strategic partnership that we tried to develop between NATO and Russia." He said the Russia-NATO relations were a "new security environment" to which the alliance is adapting. Last Thursday, Russian Foreign Minister Sergey Lavrov said that Moscow is actually ready for cooperation with NATO, and that it was the Alliance that cut off all ties. At a meeting with his German counterpart, both mentioned that now attempts are being made to restore some of the contacts. NATO officials, including the Secretary General, have repeatedly accused Russia of sending troops, weapons and hardware to the self-proclaimed republics fighting against Kiev's rule in eastern Ukraine. No solid proof has been provided so far, though, with most of the "evidence" drawn from unverified social media sources. Moscow has refuted all these claims. Meanwhile the head of NATO's European forces, US Air Force General Philip Breedlove, has been calling for months to send lethal weapons to Ukraine. A bill to allocate $200 million to that end has already been approved by the US Congress Armed Forces Committee and will be reviewed by the House of Representatives later in May. Moscow has repeatedly warned that sending weapons to Ukraine will only hinder the peace process there. European nations have also been reluctant to arm Kiev, fearing an influx of arms could send the situation in Ukraine spinning out of control. Some countries, however, are supplying Kiev with non-lethal defensive equipment, like body armor and unarmed armored vehicles. Cautious optimism has also been voiced at the Antalya summit about the Ukraine peace process progress. Germany's Foreign Minister Frank-Walter Steinmeier said there had been a major breakthrough in the recent days. He said that, although he said the road ahead remains long and difficult, there is no alternative to the Minsk peace roadmap.